Chocolate belongs in everything. That’s why mole was invented. And in baked goods, it’s even more of an “of course” type of thing. I had some carrots sitting around in my fridge that I needed to use up before they rotted and for some reason I really wanted a muffin with chocolate in it. 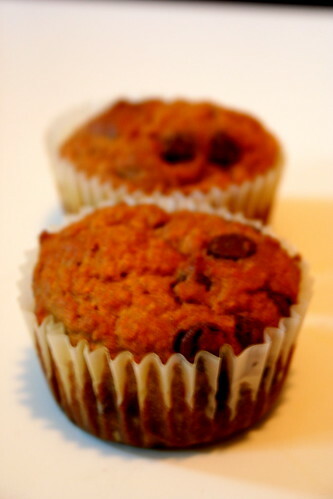 Thus the Chocolate Chip Carrot Sunrise Muffins were invented. The recipe probably isn’t unique. But it tastes good. And the orange color is so happy! Nutritional Facts: Carrots are good for you. Chocolate is tasty and has caffeine. Spices are the bomb. I riffed the recipe from Vegan with a Vengeance. Changed a few things, kept a few things. It was a good base. Preheat the oven to 400 degrees. Line a muffin tin with papers. In a large mixing bowl, mix the carrots, oil, soy milk, vanilla, and sugar. Add the flour, spices, baking powder, baking soda and chocolate chips. Mix well. Pour into the muffin papers and bake for 20 minutes until a knife inserted into the center comes out clean. Cool! I just made these at work, but without raisins, since we were out. I never thought to add chocolate chips to ‘em! I am cracking up over your nutritional facts ! And yes, chocolate does belong in everything! Yum, those carrot muffins sound divine! And what recipe wouldn’t get a boost from adding a handful of chocolate chips … sublime!And thanks for posting those vegan places in NYC; will have to check them out sometime.I love your recipes, and your new kitty. I think these muffins are the bomb.